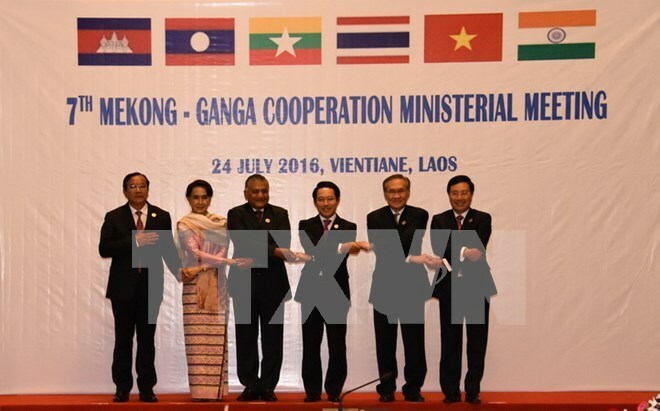 Vientiane (VNA) – The seventh Foreign Ministerial Meeting of the Mekong-Ganga Cooperation (MGC) issued a joint statement and a MGC Action Plan for 2016-2018 in Vientiane, Laos on July 24. The event was organised on the sidelines of the 49th ASEAN Foreign Ministers' Meeting (AMM 49) in Vientiane, Laos under the chair of host Foreign Minister Saleumxay Komasith. The Vietnamese delegation to the meeting was led by Deputy Prime Minister and Foreign Minister Pham Binh Minh. During the meeting, the foreign ministers of Vietnam, Cambodia, Laos, Myanmar, Thailand and India’s Minister of State for External Affairs reviewed the outcomes of the MGC cooperation since 2012, with the highlights being the establishment of the Asian Traditional Textiles Museum in Siem Reap, Cambodia, and the MGC scholarship programme which has granted more than 900 scholarships to students from Cambodia, Laos, Myanmar and Vietnam. In addition, the MGC Quick Impact Projects Fund has to date financed 20 projects in the four Mekong nations, including five in Vietnam, worth a total of 250,000 USD. For the time ahead, the delegates agreed to boost their partnership in culture, tourism, education, health care, Mekong-India connectivity, agriculture, and human resource training. The two sides also planned to provide support to their small- and medium-sized enterprises through setting up working groups and holding personnel training joint tourism promotion programmes geared towards Mekong countries’ needs and regional situation. India pledged to continue contributing one million USD per year to the MGC Quick Impact Projects Fund for the four Mekong nations.